When I posted my Guinness Chili last year, I promised that I would post the recipe for the Chili Cheese Dogs “soon”. Well better late than never, right? Summer is the season for hot dogs on the grill. 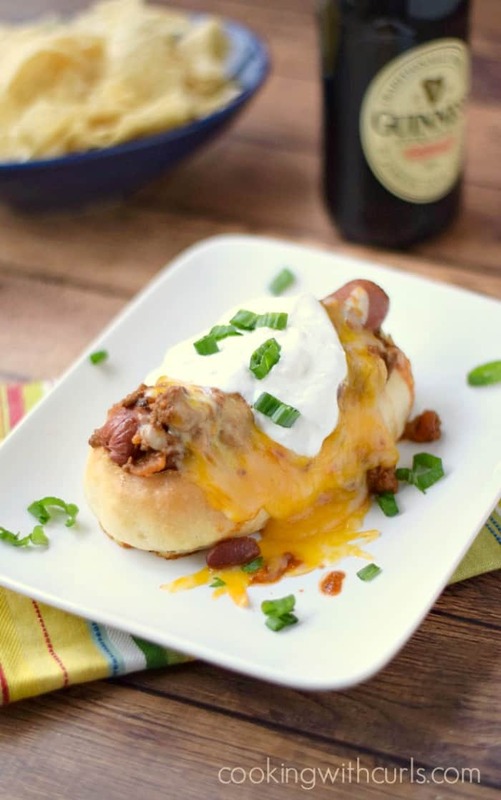 January is the season for hot dogs covered in delicious chili and cheese…and beer…and football! 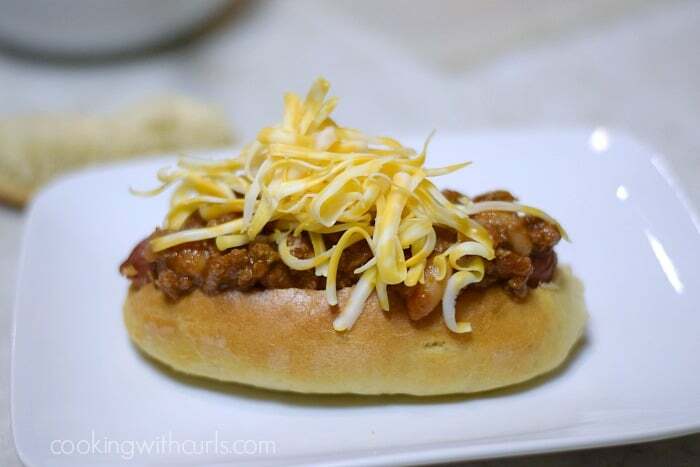 Here is my version of a Chili Cheese Dog….. 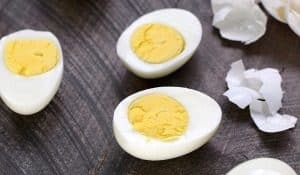 Yes, I do realize that making hot dogs is not rocket science, but there are some subtle things that can make all the difference in the finished product! First thing to take into consideration, is the Hot Dog Buns….. 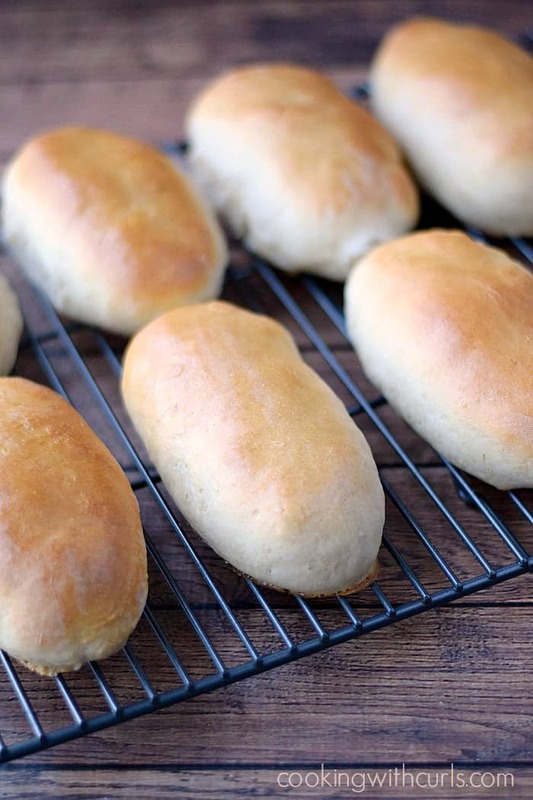 These homemade hot dog buns are sturdier than the “fluffy” buns that you find in your local grocery store bakery. These babies are up to the challenge of supporting all of that delicious chili! Jack Daniels Chili with beans. 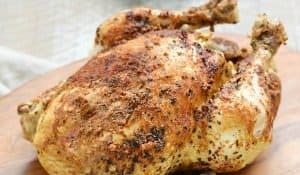 I used Guinness Chili for the images that you see in this post, it is one of my favorites! Another one of my personal preferences, Applegate Natural All Beef Hot Dogs. 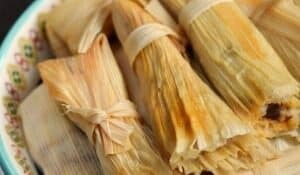 They are nitrate free, antibiotic free, and taste delicious!! 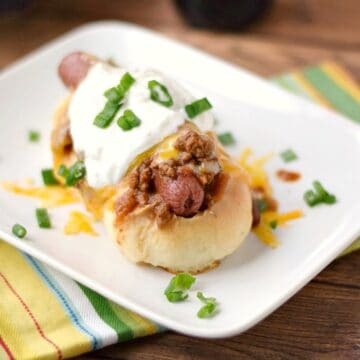 If you are using homemade hot dog buns, cut a large circle in the top of the bun and remove the excess bun to create a bowl effect…..
Now spoon some heated chili into the cavity…..
Place your heated hot dog on top of the chili and top with additional chili and cheese…..
Place in the microwave and heat until cheese is melted, about 30 seconds or so. Or place in a preheated oven until the cheese is melted. Garnish with sour cream/Greek yogurt and serve….. If you want to be a rebel and slice your hot dog bun in half, it will still work, it will just be extra messy! You will definitely need a knife and fork! 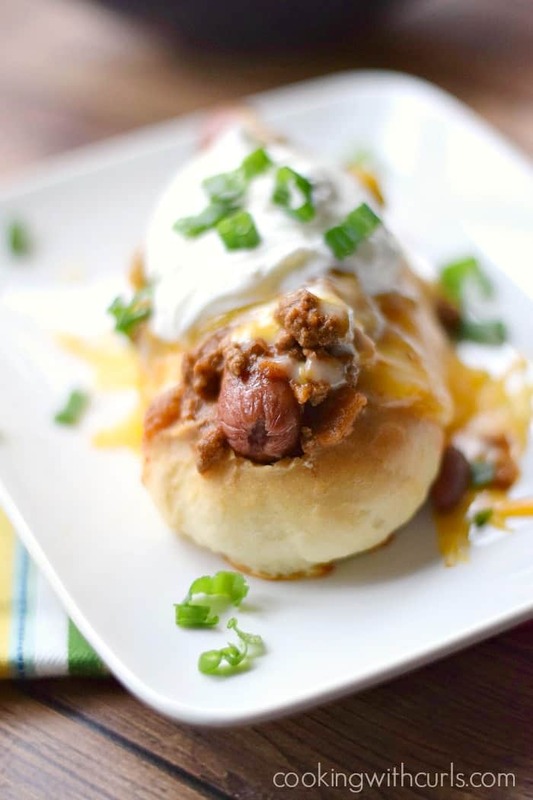 The whole family will LOVE these Chili Cheese Dogs, I dare you to just eat one! If you have made your chili ahead of time, or using leftovers, heat chili and set aside. Heat hot dogs. I usually microwave mine for 25 seconds each. 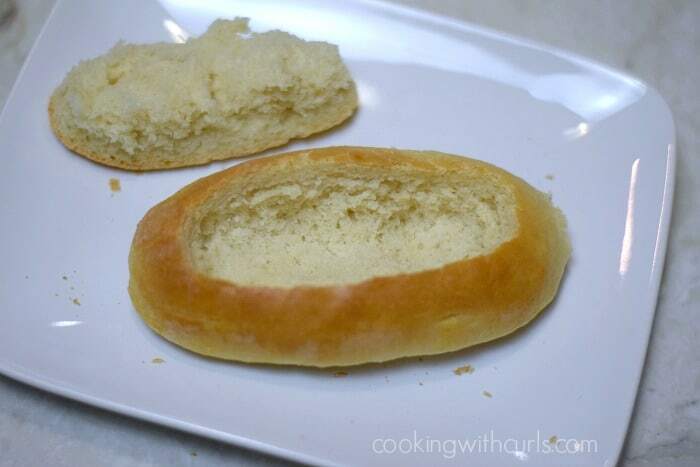 If using homemade hot dog buns, cut a large circle in the top of the bun. Carefully remove to create a bowl effect. 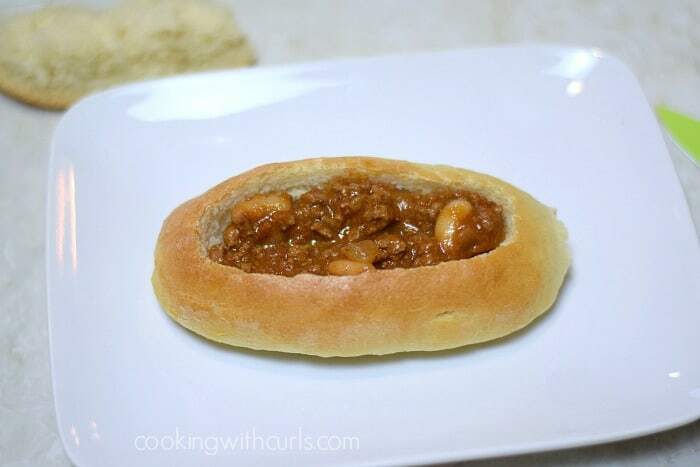 Spoon some chili into the bottom of the hot dog bun. Top with hot dog, then additional chili. Sprinkle cheese over the top and microwave to melt the cheese. Garnish with a dollop of sour cream/Greek yogurt if desired and serve. I used my favorite Guinness Chili recipe. 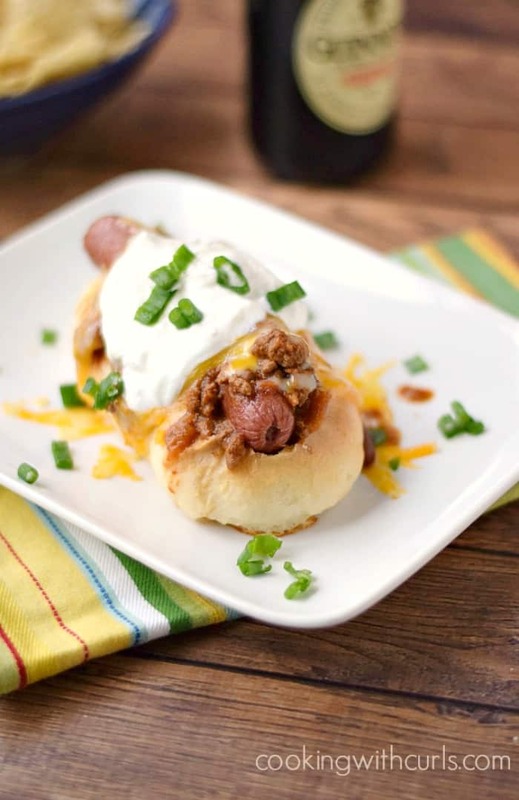 Homemade Hot Dog Buns are nice and sturdy for these chili dogs. Now THAT’s a hot dog! Yum! Yum! Perfect for game day! Oh those look great! I make them all the time but now think I need to try your buns and see if they contain the goodies better than my current method! Thanks for sharing over at Treasure Tuesday! I crave this kind of hot dog all the time! One of my (secret) favorites…..especially for game day! YUM, Lisa! !